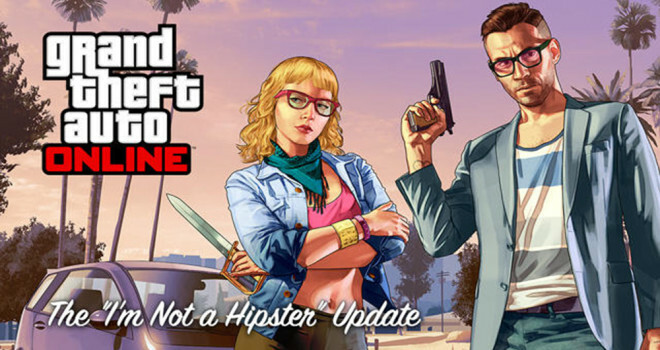 Rockstar’s Grand Theft Auto V comes out with “I’m Not a Hipster” update today on PS3 and Xbox 360. The new items available in GTA Online through the I’m Not a Hipster update include new retro print tees, skinny jeans, hairstyles, tattoos, and animal masks. There’s also seven new vehicles, including “classic nostalgia rides” like the Glendale, Warrener, Blade and Rhapsody. You’ll also find a Panto microcar (Smart Car), as well as the three-axle Dubsta, which you unlock at rank 100. The hipster theme also adds new weapons, including the Vintage Pistol and Antique Cavalry Dagger. In addition to the new items available through the I’m Not a Hipster update today, Rockstar has added 12 new Jobs across multiple game modes, as well as three new Gang Attacks in Chumash, East Vinewood, and Mirror Park. There’s also a long list of general tweaks and fixes for GTA Online included with the update.